A riviting international cloak-and-dagger epic ranging from the Spanish Civil War to the liberation of Western Europe, wartime China, the Red Scare of Cold War America, and the Cuban Revolution, Writer, Sailor, Soldier, Spy reveals for the first time Ernest Hemingway’s secret adventures in espionage and intelligence during the 1930s and 1940s (including his role as a Soviet agent codenamed “Argo”), a hidden chapter that fueled both his art and his undoing. While he was the historian at the esteemed CIA Museum, Nicholas Reynolds, a longtime American intelligence officer, former U.S. Marine colonel, and Oxford-trained historian, began to uncover clues suggesting Nobel Prize-winning novelist Ernest Hemingway was deeply involved in mid-twentieth-century spycraft — a mysterious and shocking relationship that was far more complex, sustained, and fraught with risks than has ever been previously supposed. Now Reynolds’s meticulously researched and captivating narrative “looks among the shadows and finds a Hemingway not seen before” (London Review of Books), revealing for the first time the whole story of this hidden side of Hemingway’s life: his troubling recruitment by Soviet spies to work with the NKVD, the forerunner to the KGB, followed in short order by a complex set of secret relationships with American agencies. Starting with Hemingway’s sympathy to antifascist forces during the 1930s, Reynolds illuminates Hemingway’s immersion in the life-and-death world of the revolutionary left, from his passionate commitment to the Spanish Republic; his successful pursuit by Soviet NKVD agents, who valued Hemingway’s influence, access, and mobility; his wartime meeting in East Asia with communist leader Chou En-Lai, the future premier of the People’s Republic of China; and finally to his undercover involvement with Cuban rebels in the late 1950s and his sympathy for Fidel Castro. 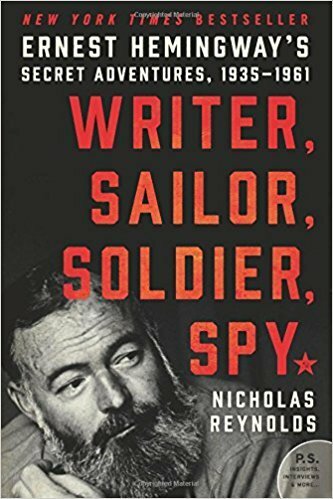 Reynolds equally explores Hemingway’s participation in various roles as an agent for the United States government, including hunting Nazi submarines with ONI-supplied munitions in the Caribbean on his boat, Pilar; his command of an informant ring in Cuba called the “Crook Factory” that reported to the American embassy in Havana; and his on-the-ground role in Europe, where he helped OSS gain key tactical intelligence for the liberation of Paris and fought alongside the U.S. infantry in the bloody endgame of World War II. As he examines the links between Hemingway’s work as an operative and as an author, Reynolds reveals how Hemingway’s secret adventures influenced his literary output and contributed to the writer’s block and mental decline (including paranoia) that plagued him during the postwar years — a period marked by the Red Scare and McCarthy hearings. Reynolds also illuminates how those same experiences played a role in some of Hemingway’s greatest works, including For Whom the Bell Tolls and The Old Man and the Sea, while also adding to the burden that he carried at the end of his life and perhaps contributing to his suicide. Writer, Sailor, Soldier, Spy was on sale on kindle a few months ago, and my mom bought it for me. I do not know if I would have bought it for myself, but I found it intriguing after I started reading it. This is a part of history, which I have read some about but not a ton. I found Hemingway’s life to be a different type of story because of all the different things he accomplished. This is a good biography to learn a lot about Hemingway and the time and place he was in during his life time.